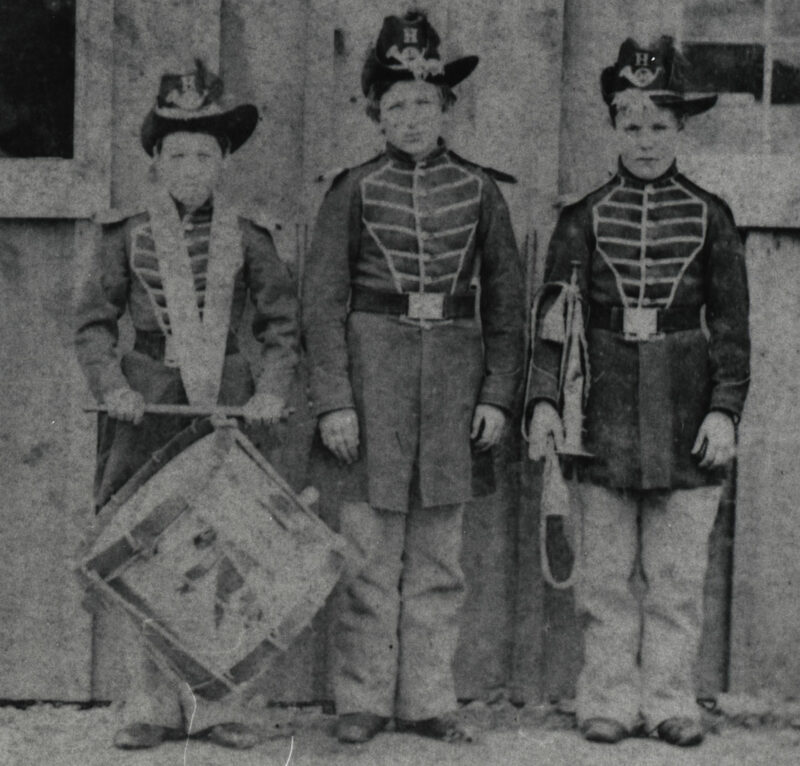 Of all the memories veterans recalled of their Civil War experience, countless reminiscences of music can be found in thousands of letters and journals of soldiers who fought on both sides. 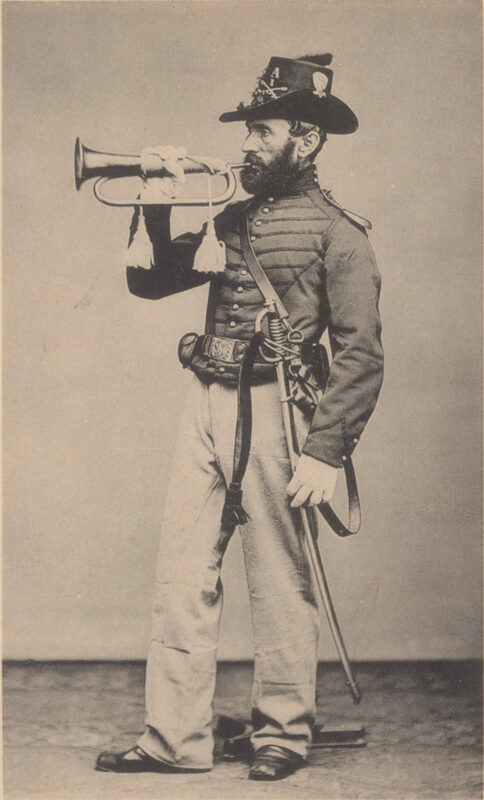 Music played a large part in the war and the field music of buglers was not only necessary for the telling of time and duties in camp but also guided the actions of troops in battle. These buglers were not part of the brass bands that were common at the beginning of the war, but rather musicians who along with fifers and drummers enlisted with a regiment of infantry or cavalry. A group of Regular Army buglers in the 1850s. 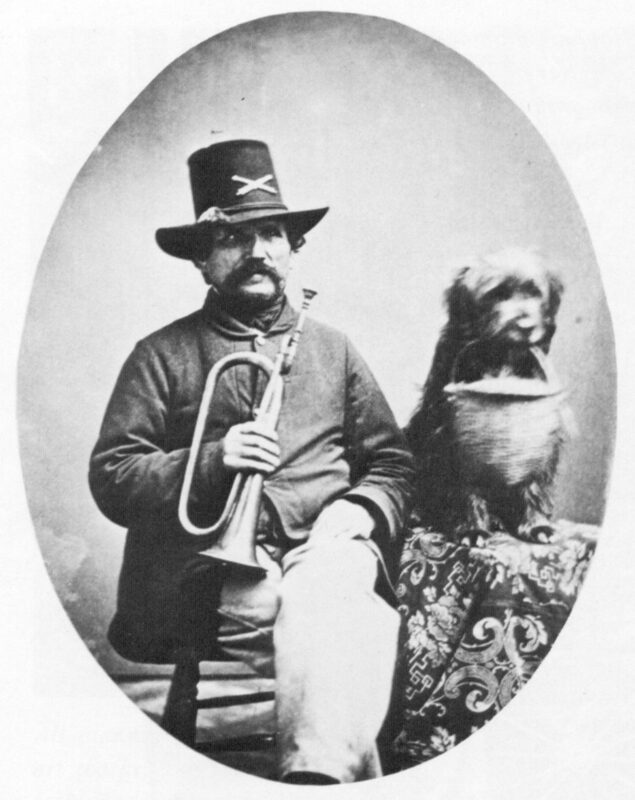 This is one of the earliest photos of buglers. Most of these musicians were young boys (some who lied to get in under the 18 year age requirement) who played bugles, fifes and drums. 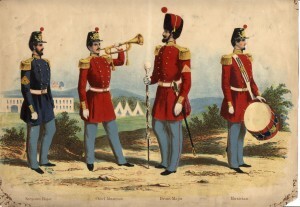 Army regulations of 1863 allowed recruiters to enlist those “such as the recruits as are found to possess a natural talent for music, to be instructed on the fife, bugle, and drum, and other military instruments…care should be taken to enlist those only who have a natural talent for music.” A school (The School of Practice) for the training of these young musicians existed at Governor’s Island in New York and manuals were available for the learning of fife and drum music. Among these manuals were Ashworth’s Fife Instructor, Howe’s Drum and Fife Instructor, Hart’s New and Improved Instructor for the Drum, and Bruce & Emmett’s The Drummer’s and Fifers Guide. Included in many of these manuals were also bugle calls. 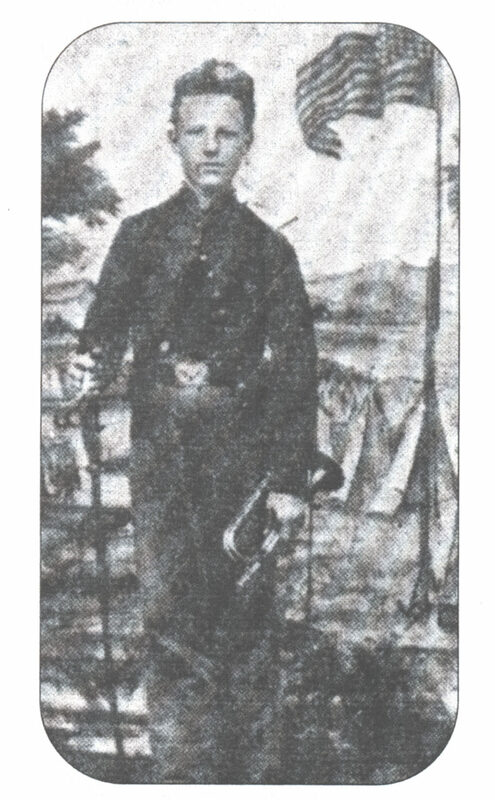 Louis Benz, bugler at West Point. 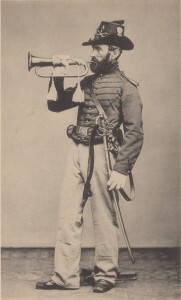 Benz was the chief bugler at the United States Military Academy at West Point for 40 years, from 1834-1874. 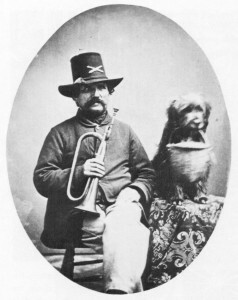 He is shown with a bugle with pig-tail crook and his dog Hans. Benz died on active duty and is buried in the cemetery at West Point. 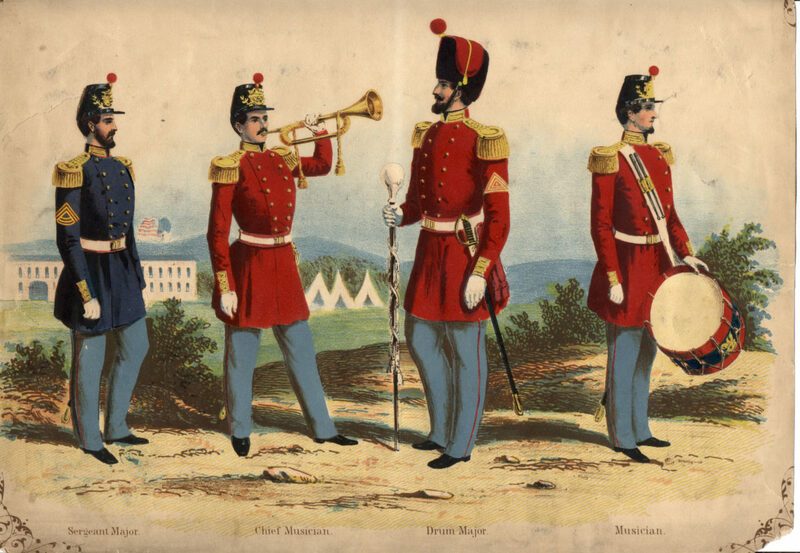 The bugle has been most associated with the cavalry and artillery while the drum and fife was greatly used in the infantry. 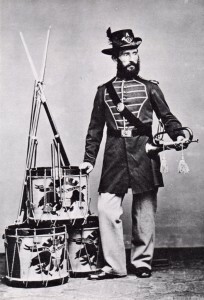 Accounts of moving to the “tap of the drum” and “falling in at the long roll” are found in many diaries and certainly many pictures show a drummer standing next to infantry companies. 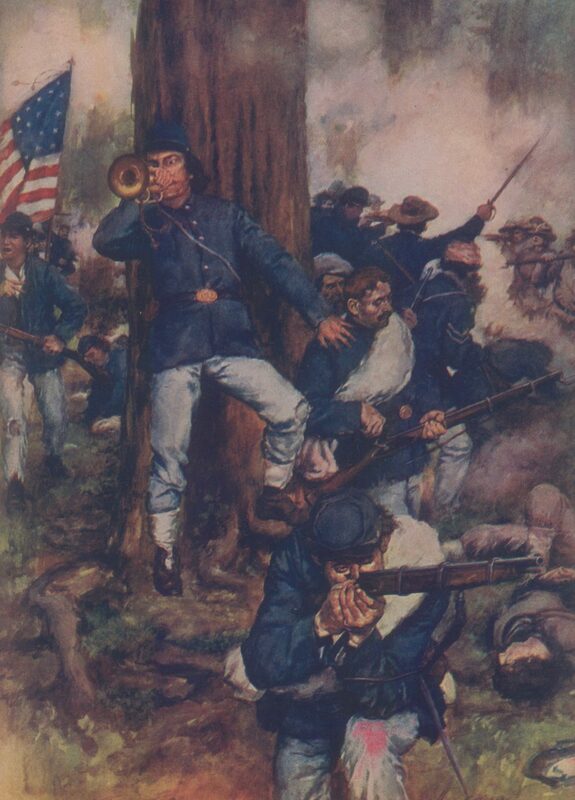 But as the war progressed, it was demonstrated that drum beats and fife tunes were hard to hear over musket and artillery fire. In previous wars troops were massed in large groups and met the enemy as large units in open fields. The drum was effective in keeping cadence but in the Civil War it was hard to hear the beats in the fighting that took place in the woods and hills that characterized warfare during that conflict. And as most of these musicians were under age, they were ordered to the rear or to ambulance duty as hostilities broke out. 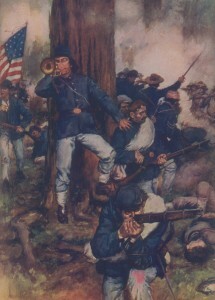 Commanders found that the bugle was heard over a greater distance and many would have them by their sides at all times. 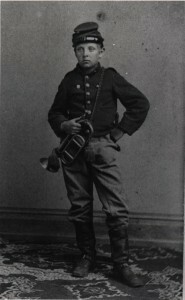 Gustav Shurmann (“The Little Bugler”) rode with General Philip Kearny and later Daniel Sickles, and Oliver Norton rode next to Colonel Strong Vincent. John Cook earned the Medal of Honor during the Civil War while serving with Battery B, 4th United States Artillery at Antietam, Maryland, on September 17, 1862. He had volunteered at the age of 15 to act as a cannoneer and as such served a gun under terrific fire of the enemy. 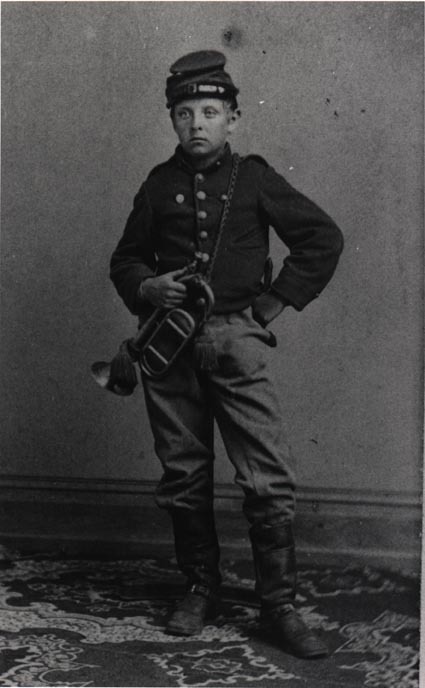 Gustav Schurmann was a twelve-year-old who served in the Civil War as bugler and orderly to Generals Philip Kearny and Daniel Sickles. He served with the “Mozart Regiment,” which was made up of New York men. He also met and befriended Tad Lincoln. « Why the Name “Taps”? This entry was posted on Sunday, January 15th, 2017 at 4:00 pm	and is filed under Bugle Stories, Buglers Through History, History of Taps, History of the Bugle. You can follow any responses to this entry through the RSS 2.0 feed. Responses are currently closed, but you can trackback from your own site.